From Kenzo, two Matryoshka dolls: at left, with a miniature bottle of L'Eau Par Kenzo Pour Femme, available at the US Kenzo website with purchases of $50 or more using coupon code 09GIFT, from December 8 - 14 only. At right, a doll with Kenzo Winter Flowers, available at Harrods in the UK for £46.50. A bit spendier, in case you know someone who has been very very good this year — from Lalique, the 2010 limited edition collector bottles. 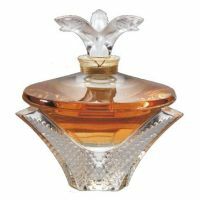 At left, Lalique Pour Femme Extrait de Parfum in the Cascade bottle, inspired by a 1937 René Lalique fountain, 100 ml for 987€. At right, Lalique Pour Homme in 30 ml Eau de Parfum, in the Scorpios bottle, 967€. Available at Essenza Nobile in Germany. From Dolce & Gabbana, the D&G Collection Gift Set, with five 20 ml D&G fragrances (1 Le Bateleur, 3 L'Imperatrice, 6 L'Amoureux, 10 La Roue de la Fortune and 18 La Lune). $65 at Dillards. Cute as a button: a hatbox from Penhaligon's, with 5 ml bottles of Artemisia, Ellenisia, Malabah, Lily of the valley and Elisabethan Rose. 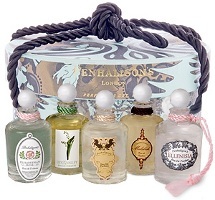 $45 at Luckyscent, and while supplies last you'll also get a Penhaligon's sampler. There's a similar set for men with Blenheim Bouquet, English Fern, Quercus, Opus 1870 and Endymion. From Histoires de Parfums, the Nomad kit, finally available in the US: mix and match 3 fragrances (1804, Noir Patchouli, 1725, 1828, 1969 or Ambre 114) in a neoprene "book", $98 at Miomia. I don’t want any of your to feel jealous, but I was the body model for the L’Eau Par Kenzo Pour Femme doll. That poor doll looks…tortured. The Winter Flower one is uber cute though, cozy and all bundled up. Oh, nice work Andrea D! I think the swimmer Matroyshka doll is adorable. I’d love to have it as a keepsake holder. I’m also intrigued by the Nomad kit, but broke ol’ me won’t be splurging on that anytime soon. Not sure which ones I’d choose, though… maybe 1876, 1804, and … ?? You can also get more than one of the same scent, which is nice. Is that the Colette one? It’s my favorite…yes, hopefully in the future they’ll have more. Andrea — HILARIOUS! I’ve never seen a sadder matryoshka. The Winter Flowers one is really nice though. That’s a cute bottle so you should be flattered! I work in retail, so I am kind of resembling the Kenzo Winter Flowers right about now. You’re in better shape than I am, Andrea. They modeled the Teletubby costumes after me. Man, some of these are nice. How cute is that Winter Flowers matryoshka doll? Awww. Am I reading that right, that it’s exclusive to Harrods? And that Lalique, so gorgeous. Even the Penhaligon’s hatbox is pretty; wish it came with different scents, though – I’d love to have one with Amaranthigh, Violetta, and Lily&Spice. But I just bought a bottle of Teo Cabanel Alahine, so I’m DONE. That’s wonderful stuff. I don’t think it’s exclusive to Harrods, but it might be exclusive to Harrods in the UK, and I do know that it is not going to be sold in the US (boo hoo). I want one. I wish that Penhaligon’s sampler tin-case were available on it’s own instead of just GWP. I’d definitely buy it. I think it is, and I had one at some point. Don’t know where you can buy it at the moment though, sorry. Pretty sure you can get it at luckyscent as a separate purchase. You can buy it at the Penhaligons website; it’s $20 U.S. Just go to their website (http://www.penhaligons.co.uk/), click on United States and Canada (if that is where you are), then click Fragrance at the top of the page, then Shop By Product Type at the left, then Fragrance Gift Sets, and finally Scent Library. I have one. It’s really nice: big generous samples. Supposedly five men’s and five women’s scents, but a lot of them are not particularly marked for gender. I just love that Penhaligon’s hatbox. Might go on the ever-growing “gift to self” list. Aaaaaaaaaaargh – I want, want, want that Winter Flowers doll. Yep. Me too. Crazy that you can’t get it in the US. Seriously, because who’s more likely to buy cute stuff that they don’t need than Americans? The Japanese? It really is cute. I smelled the D&G Gabbana gift set. They remember me of the Marc Jacobs Splashes. They did not impress me at all. Parfum- I agree. Dear Santa- What I DON”T want for Christmas; D&G Fragrance Anthology Gift Set! I’m very surprised Chanel has not done that! Ooh… I would love to get the Exclusifs in a cute little set like that. I almost fell for the Chanel parfum minis set, but there were too many in there that I didn’t really want. Of course, the holiday season isn’t over yet – all it will take is one gift card that will pay for part of it to push me over the edge. I thought exactly the same thing…probably bc the D&G bottles look like cheap knock-offs of Les Exclusifs. I’d be alllllllll over it. I didn’t like them either, but if you are going to buy them, you might as well get all 5 for the price of 1. OOOH! Histoires des Parfums! A perfume kit! Please Mr. Claus! I have a question – did Chanel Les Exclusifs ever issue a mini bottle coffret of all their scents? I’ve seen pictures in the internet, but I never did see it being sold in Chanel boutiques. If they did, I’ve missed it and/or forgotten. They did make mini bottles though. How CUTE are those Matryoshka dolls?! Must.Restrain.Myself. L’Eau Par Kenzo Pour Femme is sort of a weird choice for a winter gift, isn’t it? Especially with a bathing suit clad doll. I have a feeling this was originally produced earlier, and they’re just giving them away for a special GWP now. Yeah, but sprint/summer would have been better time to give that one away. I found a friend willing to go to Harrods, but the pretty little doll from was sold out that same day. Oh drat, what a shame! 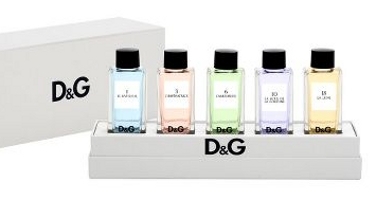 The D&G sampler would make good little gifts if you break them up – my sister was eyeing them and if I split them with another sister, then that’s a cheap gift.